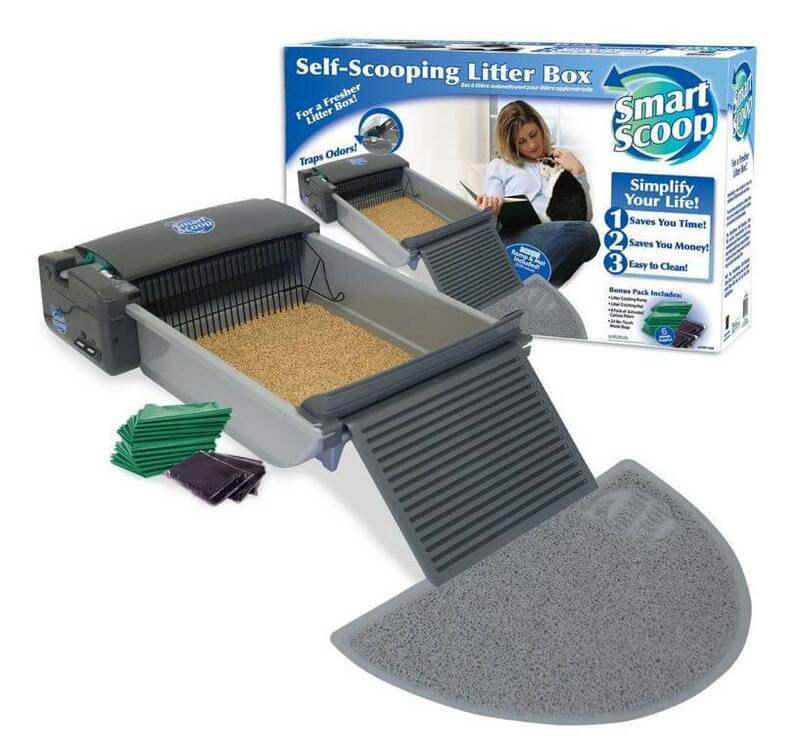 The SmartScoop Automatic Self-Cleaning Litter Box is probably one of the more simpler and compact models of automatic litter tray available on the market right now. Not only can it help take the chore of scooping up cat litter out of your hands, but it also has the ability to sit in the corner of the room without taking up much space. But does it present good value for money? How does it work for people who have multiple cats, or a cat that is fairly large. Here we will show you if the SmartScoop Automatic Self-Cleaning Litter Box is the right litter tray for your home, and we’ll answer some frequently asked questions about. Easy To Clean And Maintain: A lot of the self-cleaning litter trays available on the market right now involve a lot of maintenance in order to ensure they run properly all the time. Some involve pulling it apart so then you can properly clean some of the parts. With this litter tray however, you can easily pull pieces of the litter tray apart so then you can clean them easily. You won’t have to do it often, but when you do clean this tray, it is a very simple task. Free To Use Any Litter: If you have a cat that is used to using a certain kind of litter, they can become a little uncomfortable when they find something new in its place. This is why many self-cleaning trays that come with their own special litter sometimes are not very appealing to cats. With this litter tray however, you are free to use whichever clumping litter you like. This means that your cat will still feel comfortable going to the toilet even though it is in a new environment. Plenty Of Supplies Included: When you are buying something like a self-cleaning cat litter tray, the last thing you want is a massive expense followed by having to spend even more money so then you can get all the extra parts and supplies that are needed. With the SmartScoop Automatic Self-Cleaning Litter Box, you receive six months worth of supplies. This includes everything from the waste bags to the filters that control the odor. This is a great way to save yourself money over a six month period, instead of buying replacement supplies constantly like you would with other trays. Gaps In The Grating Are Too Large: The grating that is used to clear away the cat’s waste and used litter has quite large gaps in it. This means that if you have a kitten that only has small bowel movements, the grating may not be able to pick it up. There is also the possibility that waste can get stuck to the grating, forcing you to clean it regularly. The best thing to do is make sure that you are buying the latest model, as this has smaller spaces in the grating. Otherwise, you may find yourself having to clean it on a regular basis. Sensitive Motor: Some of the people who have bought the SmartScoop Automatic Self-Cleaning Litter Box have said that the motor is quite sensitive. It can break down on occasion, or sometimes struggle to deal with the waste that your cat has left, even if it is only a small amount. In most cases, people have been able to call SmartScoop and they have been given a replacement motor free of charge. This is very helpful, but it is a bit of an inconvenience. If you are okay dealing with problems with the motor however, this is still a helpful purchase. Odor Filter Not Always Working: Even though this particular model of self-cleaning cat litter tray comes with a odor filter, many customers have complained that it still smells a lot after the cat has paid a visit. This could mean that the odor filter hasn’t been installed properly, but otherwise it means that it is ineffective. If you are okay with emptying the tray whenever the smell is bad then this is not really an issue, but if you wanted this litter tray to help prevent odor, then it could prove disappointing. 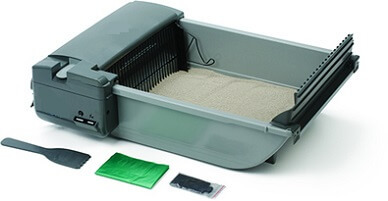 One of the great things about the SmartScoop Automatic Self-Cleaning Litter Box is that it comes with a helpful ramp on the front so then cats are able to climb in and out easily. It means that your cat should not have to climb over the sides in order to get in and out. If it does decide to do this however, the sides of the litter tray are low enough for an older cat to manage the climb without any concerns. There are quite a few models of self-cleaning litter trays on the market that are able to run on batteries. This particular model however needs to be plugged in. However, because it only runs on a timer, it doesn’t use up that much electricity while it is plugged in. It does however mean that you need to keep it reasonably close to a plug socket, which might reduce the number of places in which you can keep it. There are so many models of self-cleaning litter trays out there right now that only result in extra expense. A large number of them require you to constantly buy specific supplies such as specific bags and types of litter, which leads to a very large sum of money. With the SmartScoop Automatic Self-Cleaning Litter Box however, you will find that the six month supply of replacement parts that is provided with the litter tray will save you a great deal of money. Not only that, but you are free to purchase your own brand of clumping litter so then you cat feels comfortable to do its business in a new environment. This is my first automatic cat litter box. I love it. I have one cat and kitten and clean it about every 5 days. The grate does let small pieces through especially from kittens, but scooping by hand once a week is not a big deal to me. It preforms better if you don’t go above the highest fill line, but even then I’ve had no problems. When I bought mine it didn’t come with a ramp. Is there somewhere I can purchase the ramp? I couldn’t find one online, but you can try contacting the company: http://www.smartscoop.com/products.html and ask them directly.